StoneSet addresses all of these issues. StoneSet addresses public safety concerns because it is porous. Water doesn't pool on the surface but flows down to the ground underneath. This means that the surface dries more quickly, reducing slips and falls. Sidewalks, pathways and bike lanes also drain rapidly. 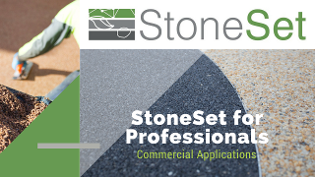 StoneSet is trip hazard free and adds traction for wheelchairs, making accessibility a breeze. StoneSet is also pleasing to the eye. It is available in many colours, forms, and shapes may be easily incorporated into it. It is also appropriate for vehicles and is suitable for roads, highways and parking lots. The porous nature of StoneSet will also lessen the need for unattractive roadside drainage systems. StoneSet always seeks to benefit the environment by preventing pollution and minimizing waste. Locally sourced and recycled materials are used for StoneSet and installed without the need for water. Landscapers, residents and city officials all benefit from the porous nature and environmental friendliness of StoneSet.